Blonde on Blonde: A double album that transcends time, defies space, suspends reality, and looks through the human soul and tells the listener characteristics about themselves they didn’t know. Professor Sean Wilentz, historian-in-residence for Bob Dylan’s Web site, comes as close to summing up its brilliance in his superb Bob Dylan In America as any who’ve tried:“The songs are rich meditations on desire, frailty, promises, boredom, hurt, envy, connections, missed connections, paranoia, and transcendent beauty—in short, the lures and snare of love, stock themes of rock and pop music, but written with a powerful literary imagination and played out in a pop netherworld.” No lie. As part of its Bob Dylan catalog restoration series, Mobile Fidelity is thoroughly humbled to have the privilege of mastering the iconic LP from the master tapes and pressing it on 45RPM LPs at RTI. The end result is the very finest, most transparent analog edition of Blonde on Blonde ever produced. Forever renowned for what the Bard deemed “that thin, that wild mercury sound,” the album’s famed aural character lives and breathes on this superb version, with wider and deeper grooves affording playback of previously buried information and lifelike presentation of the studio sessions. Prized for a unique sound that cultural critic Greil Marcus tagged “the most glamorous record imaginable; listening you [can] see the checkered jester’s suit Dylan had worn on stage for the nine previous, furious months,” Blonde on Blonde is to music, production, prose, and performance as what hydrogen is to water. The secret to its inimitable aural character partially stems from Dylan’s request in Nashville to producer Bob Johnston to remove the baffles from the studio room, allowing the musicians to interact as well as the music to assume a more organic quality that drifts from one microphone to another.Mobile Fidelity’s reissue captures this ensemble ambience, with echoes, resonation, and some of the most natural timbres you’ll ever hear in plain sight. The story of Blonde on Blonde is almost as compelling as the music within. 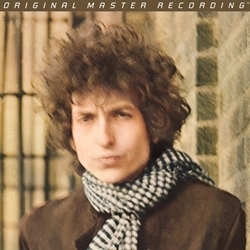 Dylan, frustrated with how initial attempts fared in New York, relocating to Tennessee and pairing with Nashville’s top session players as well as members of what would become the Band, feverishly chasing perfectionism while also arriving at an on-the-fly feel that remains a reference point for recorded music. The Bard sweated over lyrics, demanded his band get the exact sounds he heard in his head, and limited most takes to a handful at most. A majority of songs were recorded long after midnight, the post-A.M. vibe reflected in the nocturnal aura, woozy optimism, inversion of intervals, and spiritual soulfulness of the playing. So how did Mobile Fidelity do here? The sound and overall presentation are simply astonishing. I don’t care how many time you’ve heard this album in stereo, you will hear musically significant details in every track. The instrumental separation and subsequent release of inner detail boggles the mind and ear. The release of information and textures on, for example, the late Kenny Buttrey’s kick drum alone (he died in 2004 at age 59, which means he was but 21 when he drummed on this record) will have you shaking your head. Same for the rhythm guitar fills and the keyboard parts. Instrumental separation, dynamics, rhythmic drive, textural complexity, bass clarity, placement in space, every aspect of what makes a recording compelling are ramped way up compared to the 3 3A pressings I have, two of which include the Claudia Cardinale photo so I assume them to be early pressings. Dylan’s voice remains somewhat caustic and harsh as intended. The originals sound soft and mushy by comparison even though I used to think the 3A pressing sounded more than fine.